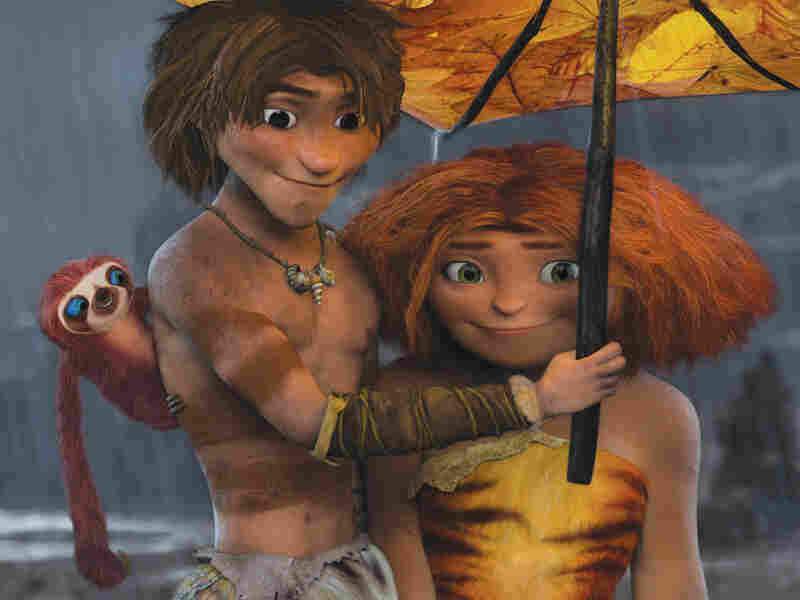 Movie Review - 'The Croods' - You Can Give A Neanerthal New Colors, But You Can't Give Him New Jokes What's a road trip comedy without roads, cars or cities? The Croods is a good guess. An all-star cast and arresting 3-D graphics show this fun family film with Neanderthal roots is ultimately meant to launch a new franchise —which isn't necessarily a bad thing. The makers of the animated Vikings comedy How to Train Your Dragon have come up with an animated caveman comedy that might as well be titled How to Train Your Father. Instead, they've called it The Croods, and centered it on a cavegirl named Eep (Emma Stone) who has a dad she sees — entirely accurately, let's note — as a knuckle-dragging Neanderthal. Voiced by Nicolas Cage, dad is loving but dim, and as you'll guess from his bedtime stories — all of which involve characters who die when they encounter anything new — cautious to a fault. "The world is ending," he announces, as his sloth rasps a fanfare for emphasis. "Come with me." "I can't," she replies, and returns to her cave. Guy (Ryan Reynolds) and Eep (Emma Stone) must fight the conservative outlook of Eep's father and convince the Crood family to move. Neander-girl meets Sapien-boy, and never the twain would meet again, except that the very next day, Guy's prediction starts to come true. A landslide destroys the cave while the family is out, and beyond the rubble they find a new world of bizarre creatures. Think The Flintstones on James Cameron's Pandora, with the Croods nearly becoming crudites for critters ranging from saber-toothed housecats to a flock of tiny razor-toothed birds that look like piranha-keets. For a while, I thought there might be a political parable intended here — Cage's conservative dad competing with his daughter's progressive boyfriend for the right to chart a path forward for the family of man — but it's pretty quickly clear that the filmmakers don't actually have much on their minds besides jokes. Most of these jokes are based on stereotypes nearly as ancient as the cave drawings the characters occasionally reference — not just overprotective dads and girls who love shoes, but savage toddlers, annoying in-laws and subservient moms. If the digital 3-D gorgeousness owes a lot to Cameron's world-creating work in Avatar, the plot of The Croods is structurally crude — just a Paleolithic road trip with detours for slapstick and sentiment. It's less about breaking new ground, or even breaking in new characters, than about creating an Ice Age-style franchise. Still, as family viewing, it's pleasant enough: primitive, yes, but in a digitally sophisticated way that's boisterous, funny and will no doubt sell a lot of toys.